He was an uncommonly handsome man. While not the equal of Gall in magnificence and imposing stature, he was physically perfect, an Apollo in symmetry. Furthermore he was a true type of Indian refinement and grace. He was modest and courteous as Chief Joseph; the difference is that he was a born warrior, while Joseph was not. However, he was a gentle warrior, a true brave, who stood for the highest ideal of the Sioux [Lakota.] Notwithstanding all that biased historians have said of him, it is only fair to judge a man by the estimate of his own people rather than that of his enemies. 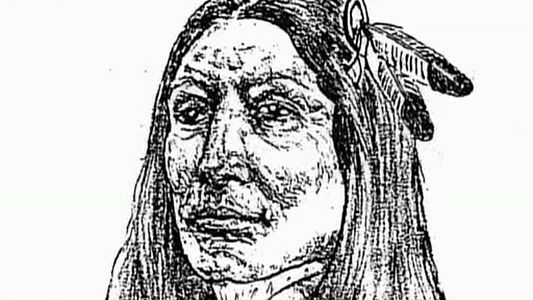 The boyhood of Crazy Horse was passed in the days when the western Sioux saw a white man but seldom, and then it was usually a trader or a soldier. He was carefully brought up according to the tribal customs. At that period the Sioux prided themselves on the training and development of their sons and daughters, and not a step in that development was overlooked as an excuse to bring the child before the public by giving a feast in its honor. At such times the parents often gave so generously to the needy that they almost impoverished themselves, thus setting an example to the child of self-denial for the general good. His first step alone, the first word spoken, first game killed, the attainment of manhood or womanhood, each was the occasion of a feast and dance in his honor, at which the poor always benefited to the full extent of the parents’ ability. Big-heartedness, generosity, courage, and self-denial are the qualifications of a public servant, and the average Indian was keen to follow this ideal. As every one knows, these characteristic traits become a weakness when he enters a life founded upon commerce and gain. Under such conditions the life of Crazy Horse began. His mother, like other mothers, tender and watchful of her boy, would never once place an obstacle in the way of his father’s severe physical training. They laid the spiritual and patriotic foundations of his education in such a way that he early became conscious of the demands of public service. He was perhaps four or five years old when the band was snowed in one severe winter. They were very short of food, but his father was a tireless hunter. The buffalo, their main dependence, were not to be found, but he was out in the storm and cold every day and finally brought in two antelopes. The little boy got on his pet pony and rode through the camp, telling the old folks to come to his mother’s teepee for meat. It turned out that neither his father nor mother had authorized him to do this. Before they knew it, old men and women were lined up before the teepee home, ready to receive the meat, in answer to his invitation. As a result, the mother had to distribute nearly all of it, keeping only enough for two meals. Another story told of his boyhood is that when he was about twelve he went to look for the ponies with his little brother, whom he loved much, and took a great deal of pains to teach what he had already learned. They came to some wild cherry trees full of ripe fruit, and while they were enjoying it, the brothers were startled by the growl and sudden rush of a bear. Young Crazy Horse pushed his brother up into the nearest tree and himself sprang upon the back of one of the horses, which was frightened and ran some distance before he could control him. As soon as he could, however, he turned him about and came back, yelling and swinging his lariat over his head. The bear at first showed fight but finally turned and ran. The old man who told me this story added that young as he was, he had some power, so that even a grizzly did not care to tackle him. I believe it is a fact that a silver-tip will dare anything except a bell or a lasso line, so that accidentally the boy had hit upon the very thing which would drive him off. It was usual for Sioux boys of his day to wait in the field after a buffalo hunt until sundown, when the young calves would come out in the open, hungrily seeking their mothers. Then these wild children would enjoy a mimic hunt, and lasso the calves or drive them into camp. Crazy Horse was found to be a determined little fellow, and it was settled one day among the larger boys that they would “stump” him to ride a good-sized bull calf. He rode the calf, and stayed on its back while it ran bawling over the hills, followed by the other boys on their ponies, until his strange mount stood trembling and exhausted. At the age of sixteen he joined a war party against the Gros Ventres. He was well in the front of the charge, and at once established his bravery by following closely one of the foremost Sioux warriors, by the name of Hump, drawing the enemy’s fire and circling around their advance guard. Suddenly Hump’s horse was shot from under him, and there was a rush of warriors to kill or capture him while down. But amidst a shower of arrows the youth leaped from his pony, helped his friend into his own saddle, sprang up behind him, and carried him off in safety, although they were hotly pursued by the enemy. Thus he associated himself in his maiden battle with the wizard of Indian warfare, and Hump, who was then at the height of his own career, pronounced Crazy Horse the coming warrior of the Teton Sioux. At this period of his life, as was customary with the best young men, he spent much time in prayer and solitude. Just what happened in these days of his fasting in the wilderness and upon the crown of bald buttes, no one will ever know; for these things may only be known when one has lived through the battles of life to an honored old age. He was much sought after by his youthful associates, but was noticeably reserved and modest; yet in the moment of danger he at once rose above them all — a natural leader! Crazy Horse was a typical Sioux brave, and from the point of view of our race an ideal hero, living at the height of the epical progress of the American Indian and maintaining in his own character all that was most subtle and ennobling of their spiritual life, and that has since been lost in the contact with a material civilization. He loved Hump, that peerless warrior, and the two became close friends, in spite of the difference in age. Men called them “the grizzly and his cub.” Again and again the pair saved the day for the Sioux in a skirmish with some neighboring tribe. But one day they undertook a losing battle against the Snakes. The Sioux were in full retreat and were fast being overwhelmed by superior numbers. 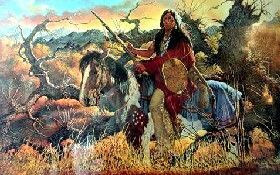 The old warrior fell in a last desperate charge; but Crazy Horse and his younger brother, though dismounted, killed two of the enemy and thus made good their retreat.